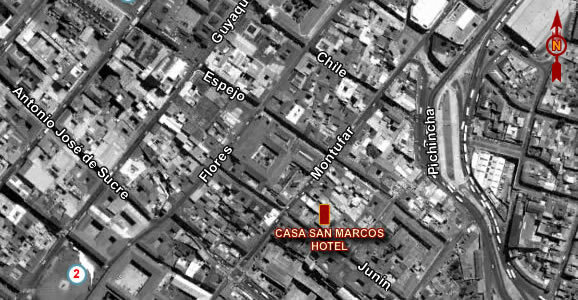 Hotel Casa San Marcos is uibicado in the historic center of Quito, just three blocks from the Plaza de la Independencia. It is a paradise for lovers of art and culture, and for those seeking a different place to unwind at the end of the day when visiting the capital. Located in a mansion in mid-eighteenth century, was restored with great care and attention to detail, capturing, for example, original wood floors, restoring the roofs of reeds and shingle and with the structure and colonial spaces. In its interio holds a wonderful collection of art, ranging from the Republican period to contemporary works. Casa San Marcos offers several common areas, good facilities and a gallery, antique shop, a cafe with a spectacular view of Mount Bun, tourist services, Internet access and laundry service. Casa San Marcos Hotel has 7 comfortable rooms decorated with delicate objects of the time, in an environment carefully chosen a quiet and relaxed atmosphere is the best choice for accommodation in Quito.